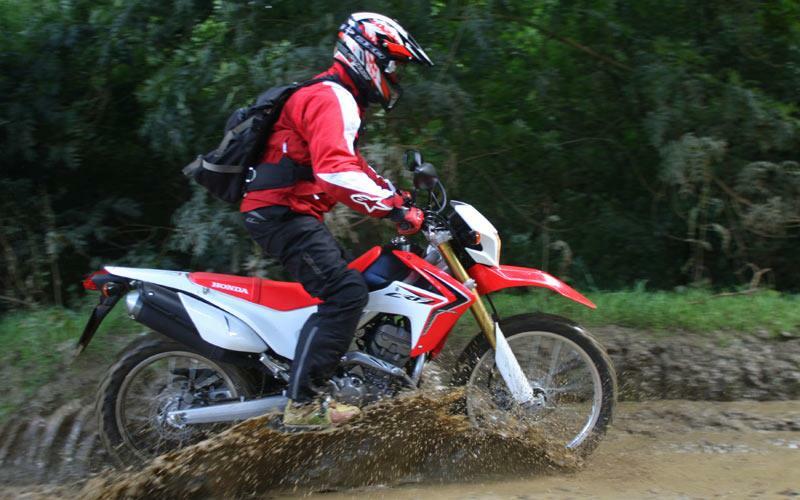 Good ergonomics , suspension a chassis means that the CRF is well balanced either on road when you’re sat down or off-road stood up. It weaves slightly at speeds over 65mph, but this could be just down to tyres. 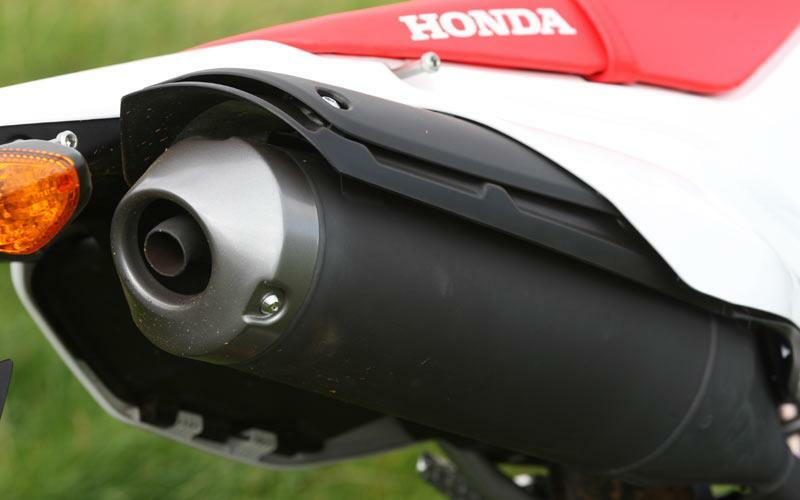 The CRF uses a de-tuned CBR250R engine with the benefit of more low and mid range power. Soft, user friendly delivery will help you make good ground without getting you into trouble. It’s also very quiet, ideal for trail riding. Difficult to speak about long term reliability as it’s a brand new bike, but it feels typical Honda and high quality. 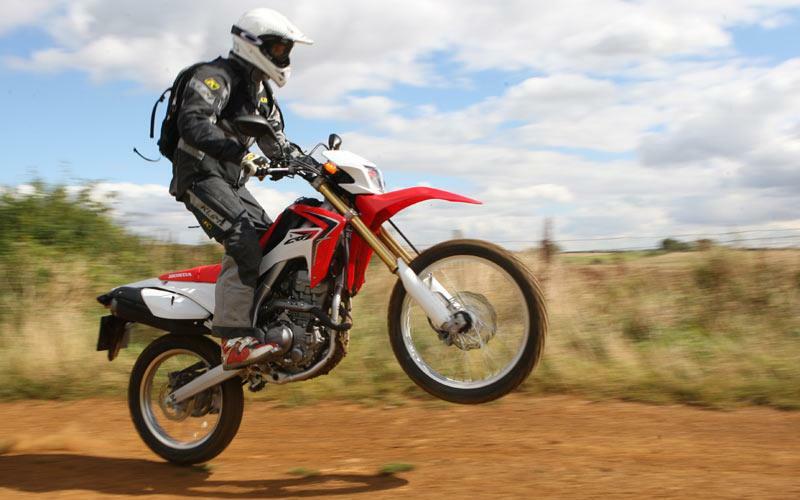 If it’s anything like its predecessors the XL or XR250 it will last for years. At £3950 it’s over £500 cheaper than its main Kawasaki KLX250 rival and it’s better. 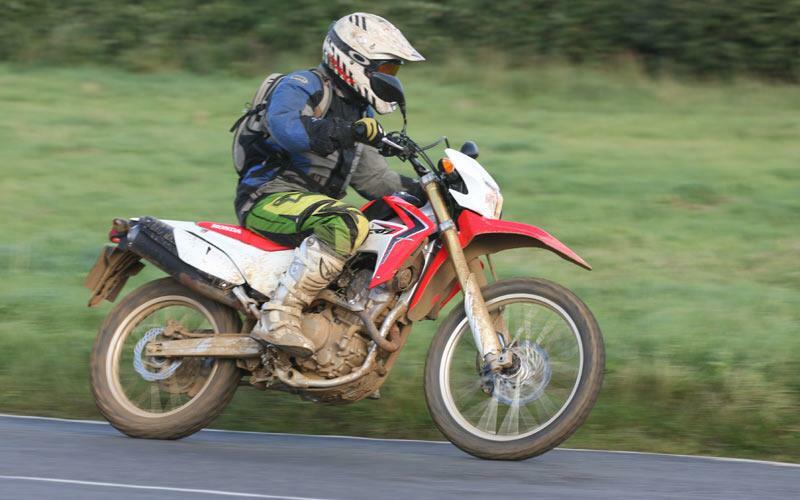 Close to £4000 is still big money for a 250, but if you’ve got a passion for the outdoors and off-road it will put a smile on your face for years to come. 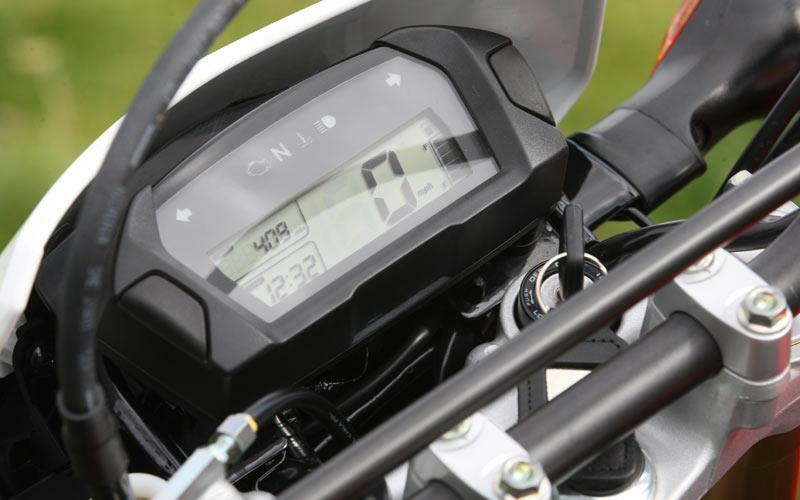 It’s an off road bike, so not masses available, but it has a neat digital dashboard with speed, tripometers and fuel gauge. 9 owners have reviewed their HONDA CRF250L (2012-on) and rated it in a number of areas. 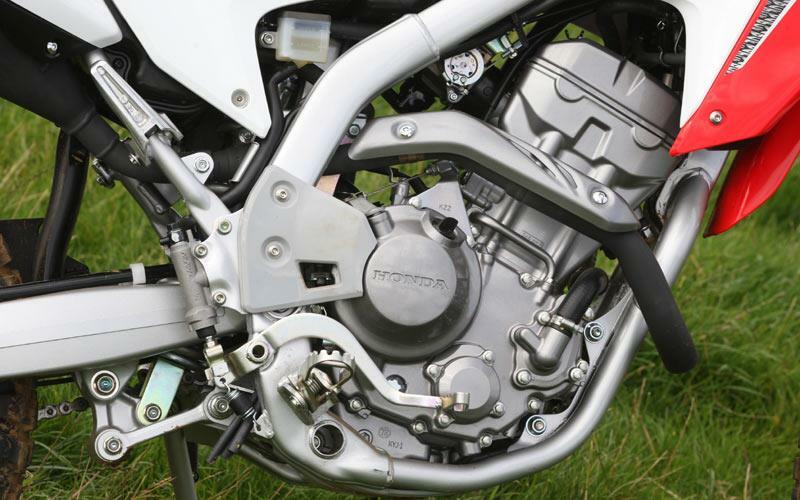 Read what they have to say and what they like and dislike about the bike below. What a cracking little bike! I would recommend this bike 100% just remember it is a 250 but it is no slouch. Best features smiles per miles per cost is fantastic value. I managed to get it for £4100 on the road. Ride it on any roads, but it really shines on single track country lanes I cant get enough. I rode it for seven hours no problem couple of comfort stops. Again I've given the bike a 5 due to the cost of the vehicle. You are not getting showa suspension or brembo top notch brakes. It isn't the fastest, it isn't the most comfortable nor are the tyres the best. But what it is just a fantastic little machine. Pillion passenger is a non starter unless you weigh about six stone each it ain't going to happen. Another 5 from me as said above remember what you are buying it is a 250 accept that and ride it for that. Then you will not be disappointed its not going to be slow, slow, slow, by any means but it wont break the speed limit either. You will see 70 on the clock and it will gladly cruise 60/65 no problem. The little engine is a gem keep it in the right gear and you will be rewarded with lots of fun. The bike has been no bother whatsoever faultless runs bob on. Word of warning I put on Oxford heated grips and cracked the throttle body and had to buy a new one at £34.00. Reason being the plastic on the throttle body towards the end where switch gear is very thin. This is due to the plastic being drawn up from this area in production to make a disk sort of. This stops the grip sliding along the throttle body onto switch gear. If your not confident and want them get dealer to do it. But serously easy enough just wish someone had warned me! The first service was £100 as said above but from now on I will do my own. Its going to be very cheap/reasonable not going to break the bank. The bike is very frugile on fuel I did 80 mile at a cost of £5 when fuel was £1.28 litre. Tyres are wearing well, when I take my bikes out least mileage will be around 80 miles. When I get home always clean and re-wax chain. Doing that makes them last a very long time. I use dry lube for the purpose of not flinging it every where. For the money rear abs switchable, clock, fuel guage, rev counter and thats about it. I put on barkbuster storm hand guards, oxford heated grips and I have run usb power to the handle bars. I have put on phone holder and the usb feeds power to this, handy for sat nav. Now the tyres well what can be said about the stock tyres all I can say is Mmmmmmmmmmm! They add fun to the ride they are 50/50 road off road supposed to be. Fast road riding is very entertaining and because it adds fun I will be very, very tempted to fit them again. I get little if no feedback when fast riding on tarmac. 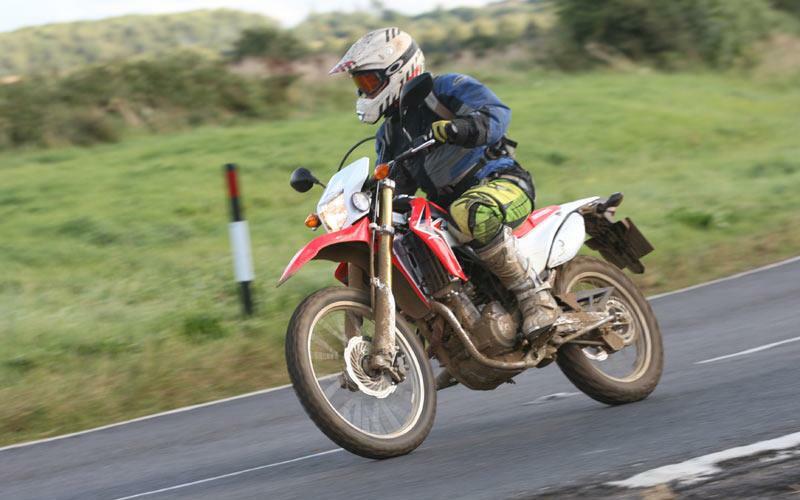 I have not yet been off road with the bike having to much fun on the road at the moment. A bike to travel the world on, by road and otherwise. I've done it all on this bike - taken it off road, climbed hills, ridden mountain passes in the highlands, tried long distance, and plenty of busy city riding. I've even tried a bit of green lane riding with a pillion (exciting, but not something I will be doing too often). It has performed flawlessly in everything. I've had it only for 4 months, but have done 4000 miles on it, and would buy this bike again in a moment. I traded in a 170bhp super bike for this, and I've had more fun on this already than any other bike I've owned. Having only 24bhp on tap will mean you'll have to change your riding style somewhat, but in this frame and set-up, it's perfect. Stick to fields, dirt tracks, back lanes, and A and B roads, and this bike will give you as much fun as any other. It will get to 60mph in about 7 seconds, which when done down a narrow lane on something with the dimensions of a large bicycle, is plenty thrilling enough! Flying up through the gears with that single cylinder sound is endlessly fun. After about 100 miles, my behind usually needs a break. Pillions tend to start complaining after about 25 miles. But this bike isn't really for carrying extra people. This is really what makes the bike. Up to 5k rpm, it's quite restrained. from 5-6.5k rpm you notice a definite pick up. Then from 6.5k + the sound changes entirely, as well as the pace, and you'll find yourself looking for every opportunity you can to give it some. I swapped a litre sports bike for this, expecting it to keep me from being naughty, but it can still easily tempt a person to do otherwise. The engine became noticeably smoother (it was already very much so to begin with), and seemed more powerful after 1000 miles, so it's worth bearing that in mind if buying from new. It's early days, but so far perfect. Adjusted the chain once, when new, and had to do it again 1000 miles later. The tires were not the best when new, but after about 500 miles improved considerably. The shock preload was set a little low from new, so I turned that up too. The adjustment was a little tricky to reach in-situ, so I removed the shock (which took all of 15 minutes), and did it like that, then popped it back on. It improved the handling on and off road immediately. £7 will fill a tank, and even with spirited riding, I'll get 120 miles out of that. The first service cost £100, but doing it yourself would be simple. The engine and bike are very simple to work on, everything is easily accessible. It doesn't have anything it doesn't need, and is pretty well set up from stock. I tried changing the sprocket gearing from a 14/40 stock set up to a 13/42 set up. It is a common modification to gain extra acceleration. However, I wasn't impressed. Fuel economy went down, the speedo was completely out of whack, and it lost more practicality than it gained. The modification would make more sense if your riding was majority off road. Stock gearing is absolutely fine for a combination of terrains however, and I went back to the original set up. I bought it from a main dealer. It was advertised at 4650, and I got 500 off, brand new. I bought mine as a winter all rounder and an ex dealer Demonstrator with 600 miles. I wasn't expecting too much from it but have been really impressed. My intention was for a winter bike that can commute and green lane with ease. The CRF was the best choice I could've made. Light, agile with enough low down grunt to keep it interesting, this bike is truly a little gem. Many riders appear to modify them relentlessly but mine will remain stock as it's fine as it is. Very easy to maintain with 8k mile service intervals, running costs are minimal and i'm getting around 80 mpg. 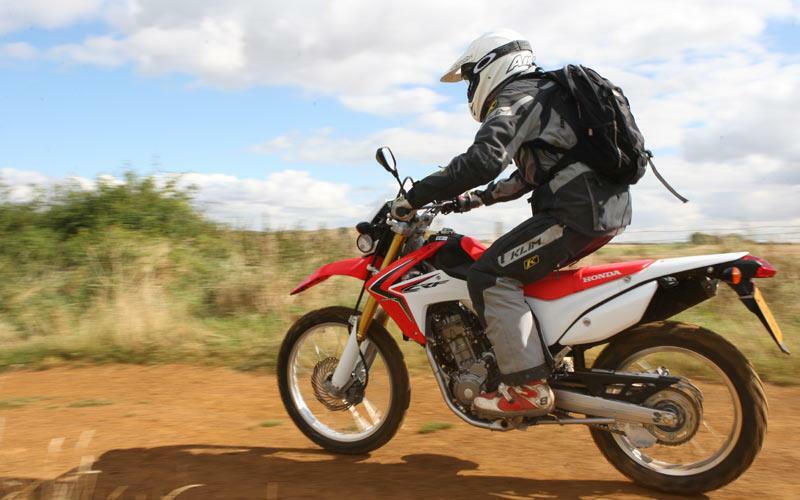 A super little bike, it does exactly what it says on the tin with a heap of fun thrown in for good measure. 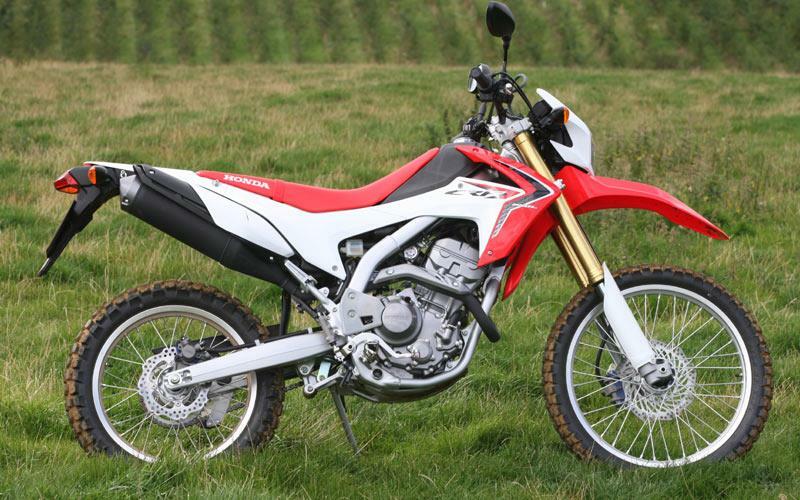 The new 2017 rally version looks fantastic too and will no doubt benefit commuters with that useful screen, ABS, slightly taller height and larger tank range.Honda have nailed it with the CRF continue to produce the goods with this brilliant little bike. Cheap to run and insure ... first service as part of my purchase ....Servicing every 8k... Parts easily available. Handguards as part of standard equipment would be a nice touch. Dealer purchased £3490 for 600 mile 2016 reg machine. Easy to ride and very agile on the trail. Very well put together and never misses a beat. Enough for what it is. As a modern economy commuter bike with some off road ability the only change I'd make is to make the front brake lever adjustable. As a dedicated 250 trail bike it's a bit heavy and the radiator looks vulnerable. I suggest it's a trail bike for the dry, flat tracks in the USA rather than the mud and stones in Derbyshire ( I use a CRF230 for that). I've done 4000 miles on it in 3 months - mostly rural A, B and tiny lanes - I've used it on dual carriageways and adopt a zen like calm as I ride at a relaxed 60mph. I'd like it to have a more road orientated seat - 150 mile rides get a bit uncomfortable towards the end - I'm looking to have the seat remade by a custom guy. If Honda put their 300cc engine in it I'll be straight down the Honda shop with a bag of money, it's one of the nicest bikes I've ridden in the past 48 years. The 4 is for the brakes not the ride quality. The rear is wooden, the front is good but the lever operates too far out. One day I'll get a spare lever and modify it to bring the actuation point closer to the bars. The clutch is smooth as silk and the gearbox is a joy - unless you decide to stop in a high gear for some reason. It doesn't like to click through gears whilst stationary so get down the box as you come up to a junction (as you should). As above, the seat is a bit thin for long days in the saddle - but I don't think the bike has been designed to be sat on for hours. I look for fuel at about 90 miles so I get a rest at least once a day. The riding position is superb: relaxed, upright and roomy. I haven't carried a pillion - I imagine it would be a bad experience for us both. For a 250 it's fine - excellent economy. As you would expect you need to rev the bike to make it come alive. 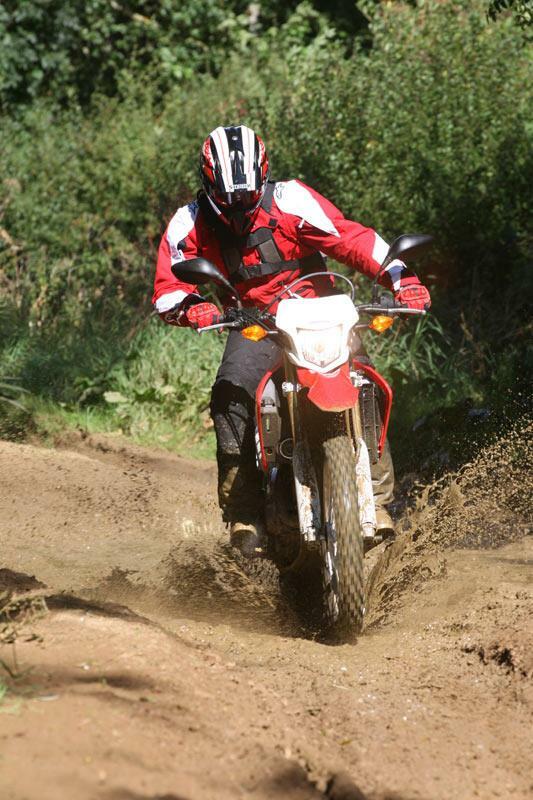 Riding in a spirited way is very engaging and requires decent rider concentration - excellent fun. As above, put the 300 engine into this chassis and I'd be straight down the Honda shop. I think going from 23 bhp to 28 bhp with the commensurate torque increase would make this a very fine all rounder. I'd like a smaller (and hence lighter) silencer. The one Honda fit to meet Californian emission rules is lumpen and sticks out too much. So far so good, I'll let you know about the finish after some winter rides - not in salt though. First service was £98 - without a valve clearance check. As the service consists of an oil and filter change and a poke round it isn't going back to the shop. I checked the valve clearances at 2000 miles - they were spot on, the next check is now due at 18000 miles. The 8000 mile oil and filter change interval seems a bit long for a revving single so I did one last week at 4050 miles. I'll be doing one every 3500 miles. I was getting 82 mpg on the original trail tyres, at 3000 miles the original rear was worn out so I put a pair of Avon Trailriders on it. I have a smoother ride and now get 85mpg. this is excellent economy as I like to keep the engine buzzing. I expect the rear Trailrider to last at least 7000 miles. The equipment is what I would expect, i.e. very little. I like having the clock and two trips. The mirrors are excellent. I'd love a centre stand but I know that manufacturers won't make provision for them on a putative trail bike. I'd also like to see heated grips as standard on all new bikes. I've added a 12V socket for the phone/sat nav and a rack and top box to make the bike suit my purpose. I shall put muffs on it for the cold weather. You don't need to pay full retail for the bike. £3900 for a new one is possible from many dealers.